For the 2018 remake, see Magnum P.I. (2018 TV series). Magnum, P.I. is an American crime drama television series starring Tom Selleck as Thomas Magnum, a private investigator (P.I.) living on Oahu, Hawaii. The series ran from 1980 to 1988 during its first-run broadcast on the American television network CBS. According to the Nielsen ratings, Magnum, P.I. consistently ranked in the top twenty U.S. television programs during the first five years of its original run in the United States. A reboot series of the same name was ordered to series on May 11, 2018, and premiered on September 24, 2018 on CBS. Thomas Sullivan Magnum IV is a private investigator played by Tom Selleck. He resides in the guest house of a 200-acre (81 ha) beachfront estate called Robin's Nest, in Hawaii, at the invitation of its owner, Robin Masters, the celebrated, but never-seen, author of several dozen lurid novels. Ostensibly this is quid pro quo for Magnum's services based upon his expertise in security; the pilot and several early episodes suggest Magnum had done Masters a favor of some kind, possibly when Masters hired him for a case. The voice of Robin Masters, heard only in five episodes, was provided by Orson Welles (one last "appearance" was provided by a different actor, Red Crandell). Magnum lives a luxurious life on the estate and operates as a P.I. on cases that suit him. The only thorn in the side of his near-perfect lifestyle is Jonathan Quayle Higgins III, played by John Hillerman. An ex-British Army Sergeant Major, he is on the surface a stern, "by-the-book" caretaker of Robin's Nest, whose strict ways often conflict with Magnum's more easy-going methods. He patrols Robin's Nest with his two highly-trained "lads", Doberman Pinschers named Zeus and Apollo. Magnum has free use of the guest house and the car, a Ferrari 308 GTS Quattrovalvole, but as a humorous aside in various episodes, often has to bargain with Higgins for use of estate amenities such as the tennis courts, wine cellar and expensive cameras. The relationship between Magnum and Higgins is initially cool, but as the series progressed, an unspoken respect and fondness of sorts grew between the pair. Many episodes dedicated more screen time to this "odd couple" pairing after the relationship proved popular with fans. A recurrent theme throughout the last two seasons, starting in the episode "Paper War", involves Magnum's sneaking suspicion that Higgins is actually Robin Masters since he opens Robin's mail, calls Robin's Ferrari "his car" etc. This suspicion is neither proved nor disproved, although in at least one episode Higgins is shown alone in a room, picking up a ringing phone and talking to Robin Masters, indicating they are two different persons. Aside from Higgins, Magnum's two main companions on the islands are Theodore Calvin "T.C." (Roger E. Mosley), who runs a local helicopter charter service called "Island Hoppers", and often finds himself persuaded by Magnum to fly him during various cases, and Orville Wilbur Richard "Rick" Wright (Larry Manetti), who refuses to use his given name Orville and who owns a local bar. In the pilot episode, this was "Rick's Cafe Americain" in town, inspired by Casablanca, with Rick appearing in suitable 1930s attire. After completing the pilot, though, executives felt that audiences would be unable to fully connect with this element. Instead, Rick moved to running the plush, beachside King Kamehameha Club, which has exclusive membership and Higgins on the board of directors. Magnum often strolls around the club, using its facilities and running up an ever-unpaid tab, further fueling the Magnum-Higgins feud. T.C. and Rick are both former Marines from Marine Observation Squadron 2 (VMO-2) with whom Magnum, a former Navy SEAL and Naval Intelligence officer, served in the Vietnam War. [note 1] The series was one of the first to deal with Vietnam veterans as "human beings" and not as shell-shocked killers, and was praised by many ex-servicemen groups for doing so. Magnum often dupes or bribes T.C. and Rick into aiding him on his cases, much to their frustration, though the deep friendship within the group, including Higgins, proved to be one of the key elements of the program over its eight-season run. Magnum comes and goes as he pleases, works only when he wants, and has the almost unlimited use of the Ferrari and many other luxuries of the estate. He keeps a mini-refrigerator with a seemingly endless supply of beer ("Old Düsseldorf in a long neck"), wears his father's treasured Rolex GMT Master wristwatch and is surrounded by countless beautiful women, who are often victims of crime, his clients, or are connected in various other ways to the cases he solves. Other characteristics specific to Magnum are his thick moustache, baseball caps (usually a Detroit Tigers or VMO-2 cap), a rubber chicken, and a variety of colorful Aloha shirts. Nearly every episode is narrated, in voice-over, by Magnum at various points. At the end of the seventh season, Magnum was to be killed off, to end the series. Following an outcry from fans who demanded a more satisfactory conclusion, an eighth season was produced to bring Magnum "back to life" and to round off the series. Lt. Yoshi Tanaka: A homicide-division police lieutenant with the Honolulu police department (played by Kwan Hi Lim), he has a slight Lieutenant Columbo-like enigmatic quality, characterized by his casual dress and ironic sense of humor. He is also, like Magnum, a Detroit Tigers fan. He is murdered early in the episode Tiger's Fan and appeared in Seasons 2–8. Agatha Chumley: Higgins' quintessentially English lady friend (played by Gillian Dobb), who seems to have a crush on Higgins. Her first appearance was in the episode "Black on White." She appeared in Seasons 3–8. Colonel "Buck" Greene: A Marine Corps aviator and intelligence officer (played by Lance LeGault), who is often Magnum's nemesis in seasons 2–8. LeGault also played John W. Newton, aka "Delta One" in Episode 1.9 "Missing in Action". Carol Baldwin: An assistant district attorney (played in all but the first appearance by Kathleen Lloyd). She appeared in Seasons 3–8 in this role; before playing Carol Baldwin, Lloyd guest starred in the episode "Almost Home" as Bridget Archer. Lieutenant "Mac" MacReynolds: A doughnut-munching Office of Naval Intelligence (ONI) lieutenant (played by Jeff MacKay), killed by a car bomb planted by "Ivan", a Russian KGB officer. Mac returns as a ghost for three episodes ("Mac's Back", "Limbo" and "Infinity and Jelly Doughnuts") and later as a look-alike character (see below). In the pilot, MacKay portrayed "Ski", a guard at the entrance gate of Pearl Harbor. He appeared in Seasons 1–3 and 7–8. Jim Bonnick: A con man and an ex-Navy pilot who was released on a medical discharge, (played by Jeff MacKay), he was also Mac Reynolds' look-alike. In at least one episode ("Mac's Back"), MacKay appeared in both roles. He appeared in Seasons 5–8. Francis "Icepick" Hofstetler: An American loan shark and major underworld figure from Chicago, and a quasi-father figure to Rick Wright (played initially by Walter Chotzen and then by veteran actor Elisha Cook Jr.). Dr. Ibold, M.D. "Doc Ibold": A minor character (played by Glenn Cannon) who appeared in episodes when the script called for a physician. First referred to as "Script Writer #1", he was known for prescribing opiates for any and all ailments. He appeared in Seasons 2–8. Cannon also played Dr. Bernard Kessler in Episode 1.7, "Never Again...Never Again". Michelle Hue: The love of Magnum's life (played by Marta DuBois); she and Magnum married in Vietnam but the devoutly Catholic Michelle had the marriage annulled after her first husband, a North Vietnamese general who was presumed dead, resurfaced. Magnum had believed that Michelle was killed during the 1975 evacuation of Saigon. She appeared in Seasons 2–8. Lieutenant (later Lieutenant Commander) Maggie Poole: The successor of the deceased Mac Reynolds (played by Jean Bruce Scott), she dislikes her superior, Marine Corps Colonel Greene. She appeared in Seasons 3–8. Luther H. Gillis: A mock film-noir St. Louis private eye with a Boston accent (played by Eugene Roche), whose deception, dissembling and disturbing capacity for violence are almost always underestimated or overlooked by Magnum. Gillis provided the narration in the five episodes in which he appeared in Seasons 4–8. Lt. Nolan Page: A hard-nosed, no-nonsense Honolulu Police Department lieutenant with a New York accent (played by Joe Santos) assists Magnum on several cases. Moki: The bartender of the King Kamehameha Club in Season 1; later replaced by Keoki, he appeared in Seasons 1–2. Keoki: The bartender/server of the King Kamehameha Club starting in Season 2. He is arrested in season 4 by Lt. Tanaka for robbing the club in the episode "I Witness". He appeared in Seasons 2–4. Robin's Nest is the fictional beach front estate on the island of Oahu, Hawaii, which serves as the residence of the main characters. In the series, it is owned by renowned novelist Robin Masters, who employs Jonathan Higgins as the estate's caretaker and Thomas Magnum as its security expert. Higgins resides in the estate's main house while Magnum occupies the guest house. Many of the indoor scenes of the original Magnum, P.I. series were filmed on the old Hawaii Five-O soundstage, as the network did not wish for their Hawaiian production facilities to go to waste after Hawaii Five-O ended its run. Through the years, fans of the show have noted commonalities in the settings of time and space (the so-called fictional TV universe) between Magnum, P.I. and Hawaii Five-O. For example, in Season 1, Episode 6: "Skin Deep", Magnum (Tom Selleck) gets on the radio pretending he's with the police and asks: "Billy, this is McGarrett of Five-O. Is David Norman armed?" In fact, the producers of Magnum, P.I. (unsuccessfully) attempted to convince Jack Lord to make a cameo. However, a 2013 episode of the re-booted Hawaii Five-0 shows the characters singing the Magnum, P.I. theme song while discussing which person most resembled the characters on that television program. Nevertheless, the purported connection between the two programs appears to be preserved in the revamped series, as explained by their creators in the industry magazine TV Guide, where plans for a crossover were announced as well as explicit acknowledgement of the coexistence of Magnum with Hawaii Five-0 in the same TV universe. In reality located in Waimānalo, the 3-acre (1.2 ha) beachfront property is located on the east shore of Oahu at 41-505 Kalanianaole Highway (Route 72) near Waimanalo Beach (21°19′30″N 157°40′48″W﻿ / ﻿21.32500°N 157.68000°W﻿ / 21.32500; -157.68000). 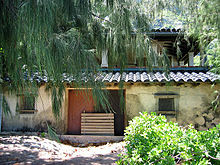 Called "Pahonu" ("turtle enclosure" in Hawaiian), it is also known locally as "The Anderson Estate" after long-time owner, local politician Eve Anderson. The grounds had been used for hundreds of years for raising green sea turtles for the Hawaiian royal family and includes a 500-by-50-foot stone wall that surrounds the former turtle-raising pond. Since 1978, the turtle pond has been on the National Register of Historic Places listings in Hawaii. Developed as a residential estate in the early 1930s, the estate comprises an 11,000-square-foot (1,000 m2) main house, a boathouse (which in the series appears as the guest house that Magnum occupies), a gatehouse, a private tennis court, a beach front and the registered tidal pool. Originally owned by Cox Communications heiress Barbara Cox Anthony, it was placed on the market with Sotheby's International Realty for $15.75 million in January 2014, and was sold for $8.7 million in March 2015 to Seth Madorsky, a Chicago lawyer with close ties to then-President Barack Obama, and later transferred to an LLC registered in Colorado. In April 2018, the estate was demolished. 1981 Ferrari GTSi (green) – seen only in the 13th episode of the 6th season; "Summer School". This car was provided by Robin Masters for his visiting nephew, 'R.J.'. Rick's convertible — Mercedes-Benz R107 (Col. Buck Green referred to it as a 450SL when Rick went missing) and at least one Corvette in an early episode in which Thomas and Rick drive side-by-side on a two-lane byway. Rick drove the Mercedes from the middle of Season 2 through to the end of the series. Rick's Datsun 280ZX — Nissan S130. Rick drove this car when the series started until middle of season 2, after which he drove the Mercedes. Magnum's Beetle — 1966 Volkswagen Beetle convertible. In 1979, having just opened up his private investigator business, Magnum drove a battered blue Volkswagen Beetle convertible, with a rusted driver's side door. Magnum's Jaguar — 1969 Jaguar E-Type. Magnum drove the quite abused red Jaguar convertible in one Season 5 episode "Blind Justice" after Higgins cut him off from using the Ferrari. The Bentley — 1937 Bentley 4¼ Litre Drophead Coupe (Gurney Nutting body). When Magnum and Higgins visit England in Season 6 opener, when Robin Masters had just bought a new estate, "Robin's Keep", Magnum drives the old Bentley, the only car included with the estate. The car was previously driven by James Bond in the unofficial 1983 movie Never Say Never Again. Ken Enderlin Charters — N9267F is a Hughes Model 369HS built in 1975, Construction Number (C/N) 1150778S, in the episodes "Dream a Little Dream" and "Missing Melody". Development of Magnum, P.I. was originally slated at ABC, which aired other Glen Larson series The Hardy Boys/Nancy Drew Mysteries and Battlestar Galactica. 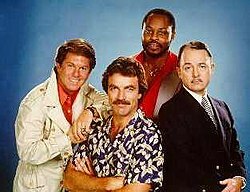 However, in January 1979, ABC cancelled both series, and development on Magnum, P.I.. Larson then took the series over to CBS. Selleck's contract commitment to the Magnum, P.I. series famously cost him the role of Indiana Jones in the first Indiana Jones film, Raiders of the Lost Ark, which went to Harrison Ford. Selleck was unable to take the part of Jones as Magnum was due to start filming in March 1980. Owing to the 1980 AFTRA/Screen Actors Guild strike, production of Magnum was delayed until December 1980, which would have allowed Selleck to play Jones. See also: Simon & Simon § Crossover with Magnum, P.I. ; and Murder, She Wrote § Crossover with Magnum, P.I. "Ki'is Don't Lie" — Magnum works with the Simon brothers to recover a stolen Hawaiian artifact that's supposedly cursed. The plot concludes on Simon & Simon in the episode "Emeralds Are Not a Girl's Best Friend". "Novel Connection" — Jessica Fletcher comes to Hawaii when an attempt is made on the lives of Robin's guests. The plot concludes on Murder, She Wrote in the episode "Magnum on Ice". For re-run and overseas purposes, the first half of these crossovers (the Magnum episode) also had alternate endings filmed, which wrapped the story up in a single episode and so allowed repeat showings as "stand-alone" stories rather than two-part crossovers. One mooted crossover from later in the series' run was with the CBS vigilante drama The Equalizer, starring Edward Woodward as the retired spy Robert McCall. According to Equalizer executive producer Coleman Luck, interviewed for a special-feature documentary on The Equalizer, the crossover was proposed by Universal Television and was opposed by the Equalizer production staff. On September 16, 2017, a group of 45 men dressed as Thomas Magnum were ejected from a Detroit Tigers game for smoking and catcalling women in the park. The story quickly became one of international interest as the group, from nearby Allen Park, Michigan gave dozens of interviews to newspapers, magazines, radio stations, podcasts and more. Universal Studios Home Entertainment has released all eight seasons of Magnum, P.I. on DVD in Region 1, 2 and 4. On October 1, 2013, Universal released Magnum, P.I. - The Complete Series on DVD in Region 1. The 42-disc set features all 162 episodes of the series as well as bonus features. * Includes the crossover Season 2 episode from Simon & Simon titled "Emeralds Are Not a Girl's Best Friend". ** Includes the crossover Season 3 episode from Murder, She Wrote titled "Magnum On Ice". *** Includes the bonus Season 5 episode from The Rockford Files titled "White on White and Nearly Perfect" featuring Tom Selleck. ****Includes bonus episodes from The A-Team, Season 2 titled "Diamonds 'n' Dust" and Knight Rider, Season 2, titled "Brother's Keeper". In October 2013, while being interviewed by Yahoo!, Selleck revealed that Tom Clancy—himself a huge fan of the series—was planning to write a screenplay for a Magnum, P.I. film in the 1990s, serving as a continuation of the show. He also added that Universal Pictures was heavily interested in producing it at the time. The project remained unmaterialized. In September 2016, ABC began developing a sequel from Leverage creator John Rogers and producer Eva Longoria centering on Lily "Tommy" Magnum, which never made it to series. ^ The three friends wear a gold Team Ring, which bears a Croix de Lorraine on a black field, as a bond of wartime camaraderie. ^ In the series finale, "Resolutions 2", the priest at Rick's wedding announces his full name as Orville Wilbur Richard Wright. Rick disliked being named after both of the Wright brothers, and preferred his nickname. The series ended in a cliffhanger, as the audience never sees whether Rick actually says "I do". The name may be a discontinuity, as early on in the series Roger E. Mosley's character had referred to him as "Elliot", though in the first episode he is identified as Orville. ^ The 1981 Edgar Award was won for an episode entitled "China Doll." ^ The Region 1 version of the Season 1 DVD release comes with an extra disk, featuring extra episodes from later in the series. ^ The Season 1 release (both Regions 1 and 2) has an error in the episode "China Doll": the musical cues are about 30 seconds off throughout much of the episode. ^ Currently, Tom Selleck stars as NYPD Commissioner Frank Reagan in another CBS series, Blue Bloods. ^ "Magnum, P.I. details". Museum of Broadcast Communications. Archived from the original on November 29, 2014. ^ Andreeva, Nellie (May 11, 2018). "Magnum P.I., God Friended Me & The Red Line Dramas Get CBS Series Orders". Deadline Hollywood. ^ "Simon & Simon details". NBC. Archived from the original on 2017-08-01. Retrieved 2017-07-31. ^ "Crossover details". Magnum Mania. Archived from the original on 2016-10-21. Retrieved 2017-07-31. ^ "Common Production Facilities". MentalFloss. ^ "Original Series, Season I, Episode 6". IMDb. ^ "Hawaii Five-O: An Episode Guide and Critical History of the 1968–1980 Television Detective Series". McFarland & Company. ^ "Are 'Magnum P.I.' And 'Hawaii Five-0' Set In The Same Universe?" ^ Tim Surette (July 19, 2018). "The No-Brainer Magnum P.I.-Hawaii Five-0 Crossover Will Happen, Obviously". TV Guide. ^ a b c d "Homes for the Luxury Lifestyle". Hawaiiislandhomes.com. Archived from the original on 2016-01-05. Retrieved 2015-11-06. ^ a b Magin, Janis L. (Apr 3, 2018). "Hawaii home made famous by 'Magnum P.I." slated to come down". Pacific Business News. ^ "Rumors swirl around sale of Waimanalo estate". KITV.com. Archived from the original on April 28, 2015. ^ "Iconic "Magnum, P.I." Robin's Nest Has Just Been Demolished". Retrieved 2018-04-16. ^ Writers Lola Landekic Will Perkins Published May 11, 2013 (2013-05-11). "Magnum, P.I. (1980) — Art of the Title". Artofthetitle.com. Archived from the original on September 8, 2015. Retrieved 2015-11-06. ^ Billboard. Nielsen Business Media, Inc. 8 May 1982. p. 68. ISSN 0006-2510. Retrieved 27 August 2017. ^ a b "'Magnum, P.I., 1980–1988': cars, bikes, trucks and other vehicles". IMCDb.org. Archived from the original on 2015-11-06. Retrieved 2015-11-06. ^ "1981 Mercedes-Benz 380 SL [R107] in "Magnum, P.I., 1980-1988"". IMCDb.org. Archived from the original on 2015-11-06. Retrieved 2015-11-06. ^ "1980 Datsun 280ZX GL [S130] in "Magnum, P.I., 1980-1988"". IMCDb.org. Archived from the original on 2016-01-05. Retrieved 2015-11-06. ^ "1966 Volkswagen Convertible 'Beetle' [Typ 1] in "Magnum, P.I., 1980-1988"". IMCDb.org. Archived from the original on 2017-02-20. Retrieved 2017-02-19. ^ "1969 Jaguar XK-E Series II in "Magnum, P.I., 1980-1988"". IMCDb.org. Archived from the original on 2015-09-09. Retrieved 2015-11-06. ^ "1937 Bentley 4¼ Litre Gurney Nutting 3-Position-Drophead Coupé [B129JY] in "Magnum, P.I., 1980-1988"". IMCDb.org. Archived from the original on 2017-04-21. Retrieved 2017-04-20. ^ "T.C. 's Chopper". Magnum Mania!. Archived from the original on 2015-11-06. Retrieved 2015-11-06. ^ "N9267F Aircraft Registration FlightAware". Flightaware.com. Archived from the original on 2016-01-05. Retrieved 2015-11-06. ^ "The Hardy Boys/Nancy Drew Mysteries". ^ "Indiana Jones: Raiders of the Lost Ark | Making Raiders of the Lost Ark". indianajones.com. Archived from the original on 2003-12-07. Retrieved 2013-02-02. ^ Nixon, Agnes (2007). "Tom Selleck: More Than Magnum". Biography. A&E. Archived from the original on 2013-10-18. Retrieved 2013-09-25. ^ Brooks, Tim; Marsh, Earle (2007). The Complete Directory to Prime Time Network and Cable TV Shows 1946-Present (Ninth Edition). Ballantine Books. pp. 1689–1690. ISBN 978-0-345-49773-4. ^ "John Hillerman Awards". Internet Movie Database. Archived from the original on September 25, 2016. Retrieved September 22, 2016. ^ "Magnum, P. I. | Golden Globes". Hfpa.org. Archived from the original on 2015-09-24. Retrieved 2015-11-06. ^ Herndon, Dave (September 21, 2017). "Tigers respond to story about Magnum, P.I. cosplayers being removed from Comerica Park". The News-Herald. Retrieved September 25, 2017. ^ a b "All 8 Seasons with Tom Selleck Come Together with The Complete Series". TVShowsOnDVD.com. Archived from the original on July 18, 2013. Retrieved July 17, 2013. ^ a b "Bigger, Better Box Cover Art for The Complete Series DVD Set". TVShowsOnDVD.com. Archived from the original on July 31, 2013. Retrieved July 30, 2013. ^ TV.com (2010-12-28). "Simon & Simon - Season 2, Episode 1: Emeralds Are Not a Girl's Best Friend (2)". TV.com. Retrieved 2015-11-06. ^ "What Might Have Been: Tom Clancy's 'Magnum P.I.'". Yahoo. October 2, 2013. Retrieved October 7, 2018. ^ Andreeva, Nellie. "'Magnum P.I.' Sequel About His Daughter In Works At ABC From John Rogers & Eva Longoria". Deadline Hollywood. Archived from the original on September 23, 2016. Retrieved September 22, 2016. ^ Andreeva, Nellie (October 20, 2017). "'Magnum P.I.' Reboot In the Works At CBS". Deadline Hollywood. Retrieved October 21, 2017. Wikiquote has quotations related to: Magnum, P.I. This page was last edited on 12 April 2019, at 23:53 (UTC).